Fritz and Brits is proud to be a Quartermaster for the Militaria Collectors Network. 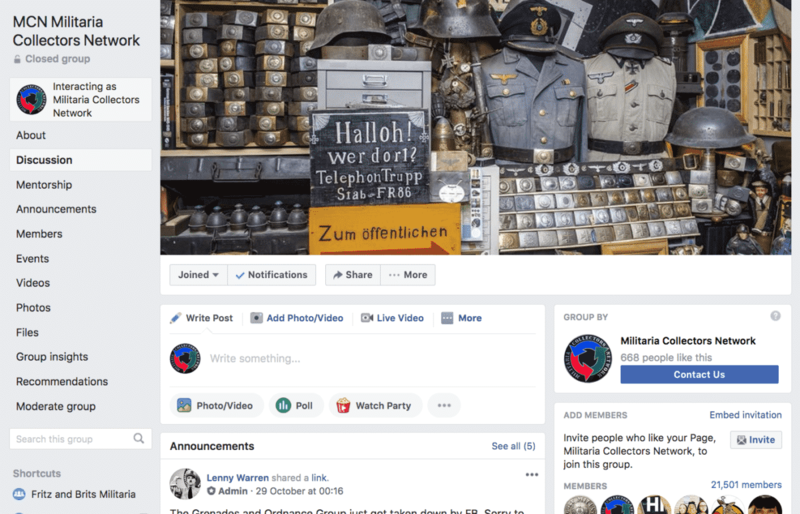 The Militaria Collectors Network, or MCN, was setup in 1998, it’s aims have always been to bring together militaria collectors and dealers from all over the world so that they may share knowledge and experience in our mutual hobby. Started by collector and amateur historian Lenny Warren, it really came about because of the disillusionment of a few collectors who were finding that the internet was of no real help if you had a problem or query. It seemed to be full of spam, adverts and the like, with no sense of camaraderie. What was needed was a group that offered help, advice, fake alerts, recommendations of honest dealers (as well as warning of bad ones!) and a friendly atmosphere. The main advantages of the MCN is that they are a group of committed collectors who really care about our hobby. They strive to help members find out about unidentified items within their collections, share information etc. As well as their website, they also have a few Facebook groups with membership of over 25k members. Above all, they care about sharing knowledge and promoting the study of military history and collecting militaria. On their sister site, theMILITARIA.shop they also offer a quality, but affordable web design service especially for militaria, antique and collectable dealers. Including domain name registration, hosting, design, technical support and ongoing admin. They will also advertise and promote your website on their site, Facebook groups and traditional print advertising. Please contact them if you’d like to find out more.